Plot: Destroy the DMZ to allow the North to unify Korea, attack Japan. Highlights: Escape and survival in Hong Kong, meeting with General Moon on the Antonov. James Bond takes on a North Korean leader who uses an experimental gene therapy that allows him to assume different identities, and to hide in plain sight as he plans to unify the South, destroy Japan, and create a new superpower with a diamond-powered satellite. Right: Draft artwork for the US hardback edition that featured the first teaser poster. 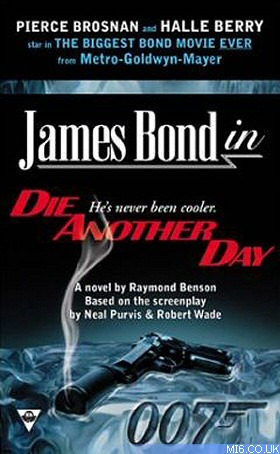 The novelization to Die Another Day was written by the then-current official James Bond writer, Raymond Benson, based on the screenplay by Neal Purvis and Robert Wade. Fan reaction to it was above average. Months after its publication, Benson retired as the official James Bond novelist. I had to invent some scenes to flesh out the book to an acceptable length. If I had simply put into prose what was in the screenplays, they would have been too short! As the management of Glidrose (and the switch to Ian Fleming Publications) changed, so did the people in charge of licensing at EON. 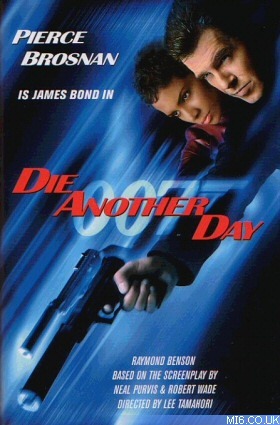 I had less freedom with The World is Not Enough and especially with Die Another Day. With the latter I wasn't allowed to change a single line of dialogue, although I could still embellish and invent some scenes. I don't consider the novelizations to be a part of my original novel series, but I'm pleased to have been given the opportunity to do them. They made me feel as if I was putting in my two cents worth to the film story. Above: American 1st edition Berkley Boulevard paperback. 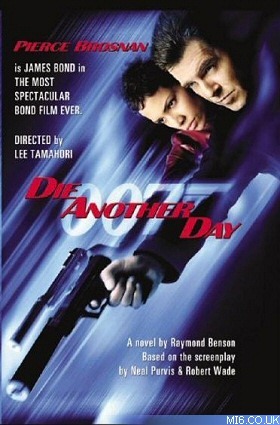 Several of the film's cut scenes are described in the book as author Raymond Benson adapted the script before the final edits were made to the movie.